The Rickie Miyake Blog: Wha' Hoppin?!??!? Boy, did the stock market do a tail spin on Monday! I had a screen of my stocks plus ones I had been watching open on my monitor at the office and was amazed to see everything going down and downer. 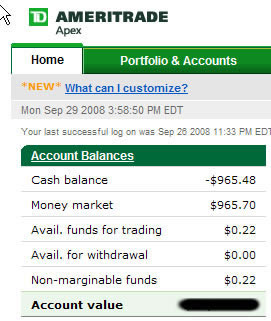 What I decided to do was to sell off some bozo stocks that hadn't done very well this year and use the losses from them to offset gains from earlier in the year so as not to have to pay taxes on those gains with money I didn't have because it all went back into stocks that lately have gone into a free fall. With the proceeds from those bozo stocks, I bought shares of other ones today: Amazon.com, Apple Computer, Yahoo and Hansen's (the soda company). I'm betting the market is gonna jump back up once the bailout plan is approved (and it will; they can't afford to keep delaying it) and these are the ones that people are going to jump on quickly and drive up the prices. Or so I think.. well, either they will or they won't, that's for sure. Notice I still have 22 cents left to buy something else. Maybe in a couple of days that will buy a ten or twenty shares of the next bank that's in trouble. You know, I was thinking today about one of my pet peeves regarding our nation's educational system. We spend an awful lot on egghead academics, the facts of which few people are ever going to use in their lifetimes after getting out of school, things that will never come up at a social gathering. Yet, we give short shrift to practical things such as managing one's personal finances. I graduated from high school not knowing the first thing about financial matters. Maybe that explains my poor state. Now, I was in the "college prep" track, but it seems to me that those who weren't so "fortunate" actually took courses that were useful - stuff like cooking, auto shop and other things that you could really put to use in real life. Probably a lot of those "vocational track" students became entrepreneurs and laughed all the way to the bank. I'm not saying academics are useless, but there ought to be a balance. Kids should be taught the things they need in order to handle what comes their way in the course of ordinary living, as well as appreciating the arts and music, staying fit, and paying attention to the egghead stuff, too. There's nothing wrong with using Personal Finance for Dummies or Rich Dad Poor Dad (that's me, the latter) as a textbook along with Quantum Calculus. Neither should basics like spelling and grammar be ignored. We're raising a generation of kids used to text messaging and instant messaging who only know how to abbreviate words. 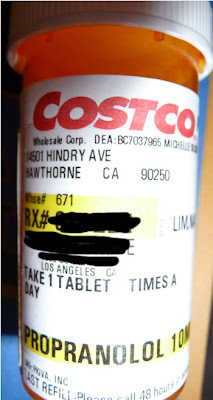 Today I was looking at the prescription bottle below. Now suppose your kid had to call in for a prescription refill on this. What would they say? "Yes, uh, I would like to order a refill of Proprano Laugh Out Loud, please. It's kind of small, I know, but you can click for a larger version. What you'll see is that the package came into the Baldwin Park station, then went to Vernon, then came back to Baldwin Park. Hey, my house is sort of on the way so why didn't they just stop by and drop it off at my house instead of taking it to Vernon and then returning it again? And the crazy thing is there's another package due tomorrow that is taking the same circuitous route. See? Another argument for practical school curriculum - like a Directions Class. Well today sure wasn't pleasant for the stock market. In the movie It's a Wonderful Life, the evil Mr. Potter tells our hero George Bailey that the way he and other folks got rich was when everyone else was selling, he was buying. I surely don't admire Mr. Potter but I think he's got a point there. Did you ever try and sing along with that song? lol..